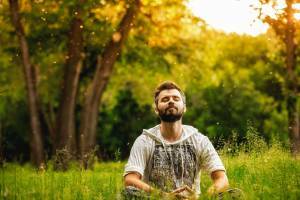 Bring out the kid in your inner soul with a challenging and unique way to train your body. You can get one of the best workouts of your life using only what you find at the playground. Swings, slides, monkey bars, benches, ladders – all of it can become your own personal ninja warrior space! Can you say…F-U-N?! It’s amazing how kids don’t think twice about climbing from one thing to the next with no fear or effort! As an adult, you may be surprised how challenging it can be to swing, climb, or balance your way across a monkey bar. The amount of core and grip strength required to fluidly make your way across those bars might elude you if you haven’t tried it since childhood. So now is the perfect time to bring back your inner kid energy – workout style! Bystanders will be so impressed with your strength skills! If you struggle finding the time and money to go to a gym or a class, or have no equipment to use at home, look no further because a park has everything you need to get the job done efficiently at no price at all! In Part A, we discussed some of the favorite playground equipment that can be used for an effective sweat session. Part B utilizes any monkey bars you can get your hands on along with a towel. Let’s review these toys so you can prepare for the workout. Hanging, swinging, and climbing on the monkey bars are an effective way to condition your upper body and core strength. There are so many different exercises and obstacle drills to perform that utilize your own body weight. The muscle angles worked can easily be changed by the grip of the exercise. It takes time to develop hand strength. Try altering your grip to change the way an exercise feels. Using varied bar grips will target different muscles. Be patient when trying these body weight exercises. 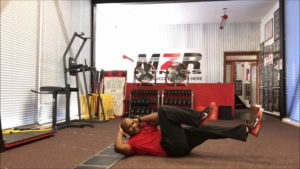 With continued practice, you will be doing movements you never thought you would be! 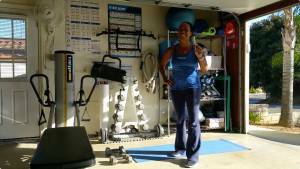 This workout utilizes a towel along with the monkey bars. I suggest cutting an old, thin beach towel so that you have more length to work with and it will be easier to grip. Basically, the longer the towel, the better use for the workout. You will be amazed with all the exercises you can do with a simple towel! Who needs suspension equipment when you can use a swing? 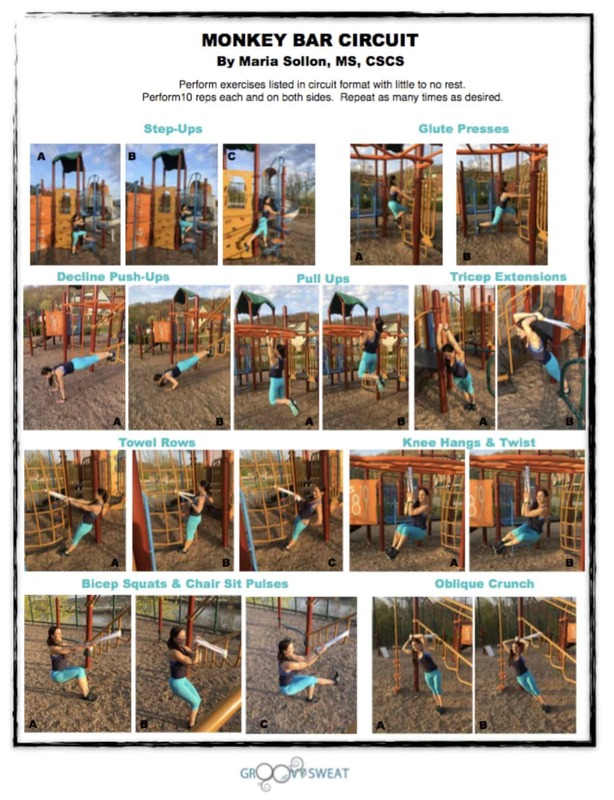 Check out Part A of the Playground Workout here to get the full workout details! Benches can be used for more than just sitting and relaxing. Utilize them as your special workout prop to hop-up, step-up, stand on, or place hands on when performing your killer exercises. You really can get a great total body workout that builds muscle and reduces fat by using these simple bits of playground equipment. There are no rules when performing a playground workout, as long as it is designed to accomplish your fitness goals. The routine can be composed of strength exercises, cardio drills, or a combination of both, and performed in any style. Circuits, interval burst, or timed segments can all be incorporated to vary the workout. The options are endless! I’ve created a workout that gets you out of the gym and onto the playground. I call it ‘The Monkey Bar Workout’! The exercises functionally strengthen, condition, and define your entire body. It also blasts calories and helps with weight loss. BONUS! This amazing workout (Part B) is composed of total body moves you can do using nothing more than MONKEY BARS, a TOWEL, and a little imagination. It’s seriously one of my favorite workouts that I’m so excited to share with you! Enjoy, have fun, and play like a kid as you challenge your body! Check out the video to see how these exercises are performed. Please ‘share’ & ‘like’ with others to enjoy in the workout fun! If these exercises become too easy for you, adjust your grip position, perform the exercises unilaterally (1 leg or 1 arm), alternate the monkey bars used, or create a progression that is more challenging for you! There are plenty more bodyweight exercises that can make this workout even more challenging! There’s no limit to what you can try and create yourself! Perform ‘The Monkey Bar’ routine up to twice a week as part of your total body fitness plan. If you like a little variety, alternate it with ‘The Swing’ playground workout – Part A, here. They both focus on functional movements, but they are different exercises that provide workout variety and promote muscular change. Learn this workout well by perfecting the grip positions and body placements to execute the exercises with good form. The movements should flow from one to the next seamlessly. Once you feel comfortable and proficient with The Monkey Bar workout (part B), incorporate The Swing workout (part A). Learn both routines well so you can alternate between the two or combine them for a workout variety. All the exercises can be mixed and matched to develop a sequence that works for you best! Swing, climb, jump, or hang around for a unique, free, and challenging workout you can only get at a park! It’s efficient, effective, and super fun. P.S. 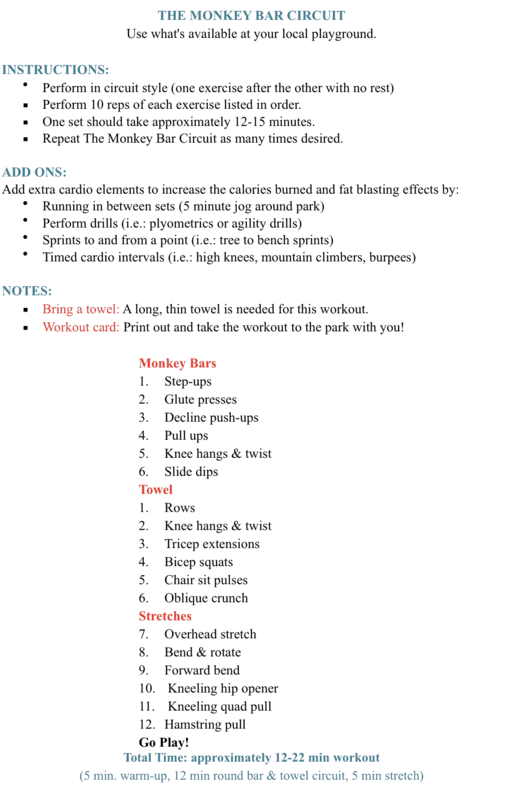 To make this workout easier for you to remember, I’ve created a printable workout card for you to take to the park on your next workout!Enjoy!